MAX ROACH was awarded an honorary Doctorate from Columbia University, on May 16, 2001. 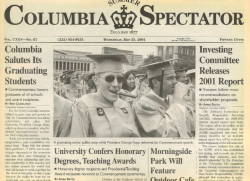 The occasion was noted in the Columbia school paper, COLUMBIA SPECTATOR, in the May 23, 2001 Graduation Issue, V CXXV N. 67 with MAX ROACH Doctorate (as “Maxwell Roach”). We only have 2 of these available! Max Roach had a career that lasted over five decades, was a pioneering BeBop drummer, and constant advocate for equality. His honorary doctorate was a noteworthy occasion in a great musician's life. We just celebrated Max Roach’s 95th birthday anniversary!! (MAX ROACH 1/10/1924 – 8/16/2007). Read and see the school paper to a living MAX ROACH getting his Honorary Doctorate at an Ivy League (!) school.